The BSO team works with residents living with dementia who are exhibiting responsive behaviours. The main goal of BSO teams in long-term care homes is to prevent the triggers that may cause residents to become agitated, largely by learning about each person’s history. “I’ve learned how to work with resistive residents, and learning about them individually, and how to deal with their behaviours individually, rather than as a group,” Nicole tells The OMNIway. Nicole says she has seen many of the interventions the team uses work. Doll therapy, pet therapy, colouring activities and one-to-one time are some of the tools the team has successfully used to curb responsive behaviours at the Peterborough long-term care home. “I like learning about residents’ triggers, what triggers them and trying to find out what brings them to that behaviour so it can be prevented,” says Nicole, who adds she joined the Riverview BSO team because she has an interest in the relationship between mental health and dementia. 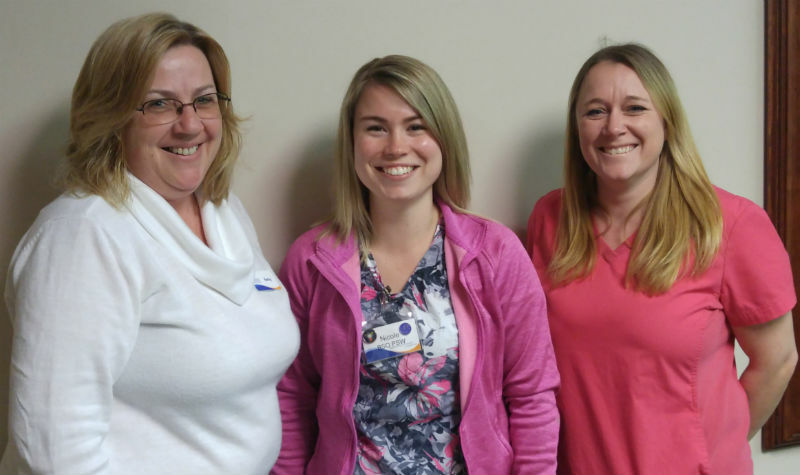 Riverview Manor BSO team lead Becky Dennie says Nicole’s top strength is her communication skills. “Nicole is able to spend one-to-one time with residents, and she has very strong listening and communication skills when working with people with dementia,” Becky says.